The other week work took me to St Mary's University, where, stepping through a door near reception, I unexpectedly came across a little oasis of a garden. 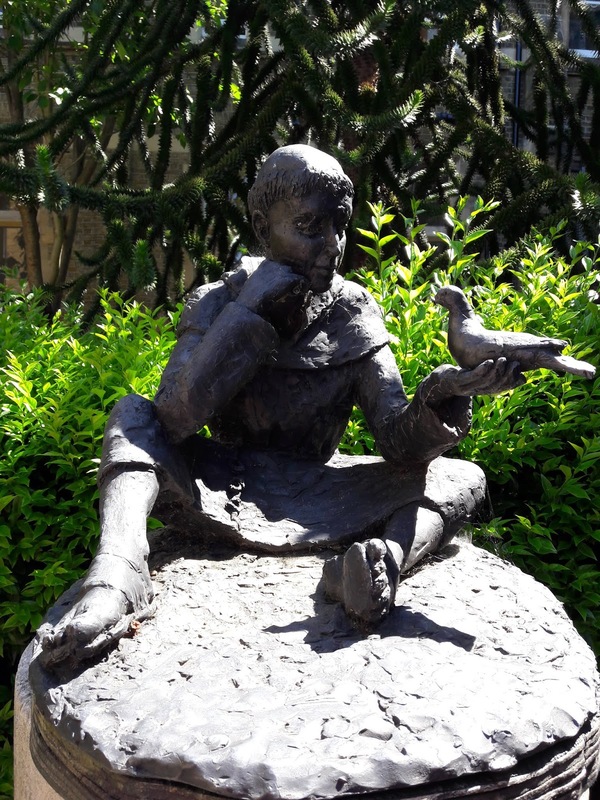 And at its centre this delightful statue of St Francis. It occurred to me that normally he's depicted standing up, maybe with arms raised as if preaching, while any birds are fluttering around; here, he's comfortably seated, legs casually splayed, fully immersed in a heart to heart with a thoroughly engaged bird. I love that, the obvious bond between them, and the quietly intent, contented look on Francis' face, as though he's completely caught up in the moment, and in listening to and learning from the innate, God-given loveliness of his feathered friend. Meanwhile, a couple of weeks ago a new statue of St Philippine Duchesne was unveiled in the garden of the Cathedral Basilica of St Louis. She is life-sized and sitting down, with benches on either side of her, inviting visitors to stop for a heart to heart. Maybe she wants to talk about her mission, or her dreams, or hear about ours... maybe she wants to whisper words of encouragement or inspiration, promise prayers or remind us of the centrality of God. Maybe she invites us to reach out to her, or to follow her gaze, at once outward and deep within, to see and share in her vision. Whatever visitors do or imagine, the idea of inviting people to sit down with a saint, to gaze at her at eye level, to engage with her at heart level, is lovely, and sheer genius. I love this idea of having saints at our level. Too often, saints are - literally and metaphorically - placed on pedestals, somewhere higher up than us. Their statues stand, usually with eyes raised to heaven, striking symbolic poses. We're encouraged to look up to - rather than across at - them, forgetting that long before they reached heaven they too were earthbound and made mistakes. Just like us, they too worked and worried, had ordinary friendships and conversations, gave of themselves and received, sought and found God in different places or situations, endured setbacks even as they were caught up in wonder at God's goodness.